Alderman Christopher Clark (right) and Harvey Park District President Anthony McCaskill (left) are vying to be the next mayor of Harvey. HARVEY, Ill. (WLS) -- Two men are vying to be the next mayor of Harvey, replacing term-limited Eric Kellogg who has been leading the financially strapped south suburban city since 2003. Ald. 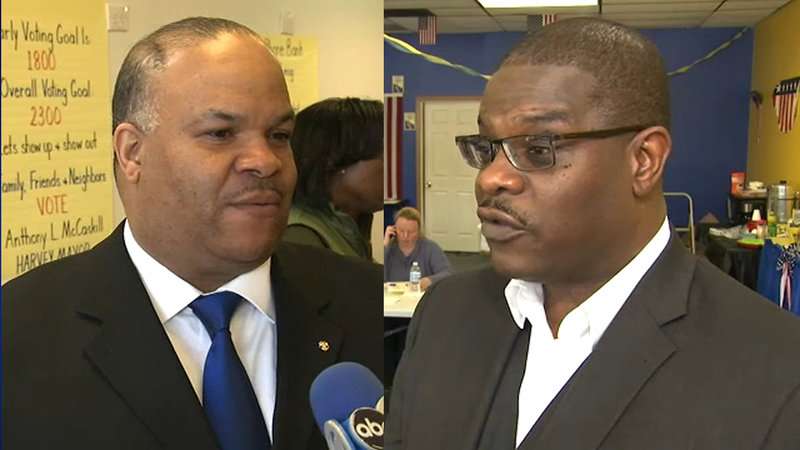 Christopher Clark and Harvey Park District President Anthony McCaskill are vying for the job. The election is on Tuesday. "We are going to keep working. We are going to keep moving forward," Clark said. "I just want to see Harvey the way it was back when I was a child," McCaskill said. The election coming just weeks after the feds raided the city's police department. "Corruption is one of the things I fought at the Harvey Park District. That's why I took some political slack. We hired an inspector general which I would do if I was elected the mayor of the city of Harvey," McCaskill said. "I think transparency is key to that, making sure that the city basically opens its books to all of its residents, making sure they know what's going on in the city. That reduces corruption," Clark said. The candidates faced off late Sunday afternoon at forum at a Celia Gregg-Hyde Park A.M.E. Church in Harvey. Hours before, McCaskill got the endorsement of Bishop Larry D. Trotter and went on the attack. "My opponent has a very checkered past. What you see here is about 40 pages of convictions from North Carolina. My question to him is, 'Why would you run with all the spite that the city of Harvey has been through with the FBI investigations?'" McCaskill said. "I really don't think you can be licensed by the Supreme Court and federal bar if you have a criminal background and done things that they have alleged," Clark said.